Through the years, we discovered if we buy our fresh turkey AFTER Xmas day; we can get a real bargain! The best time would be on the 27th of December. This year however, since we are having a get together on Boxing Day with Boon & Jackie who came back from Brisbane; we went turkey hunting (no weapons needed, duh!) in the morning. We found plenty of fresh birds at City New World. The price tags tell us the 6kg bird was $125.00 before Xmas and now, on Boxing Day; $68.00!! We bought two, one for our gathering on the same night and the other for a dinner the next night. 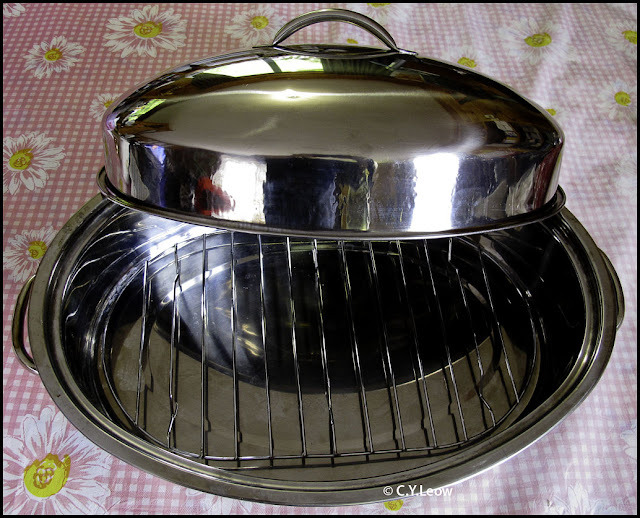 While looking for a disposable aluminum roasting tray, we saw a stainless steel roasting tray (with cover) going cheap for $29.90 because the box was torn. I decided to get that and it turn out to be a best buy yet! The Pam brand roasting pan that we bought for $29.95! Picture shot with my LG mobile phone. Photo with LG mobile phone. Our good friend Casey obviously know how to carve a turkey professionally! His method was to turn the big bird over, I learn something new! Thanks Casey! The big bird turn out to be really moist and flavorful, every one love it! We all had a great time at Boon's place! 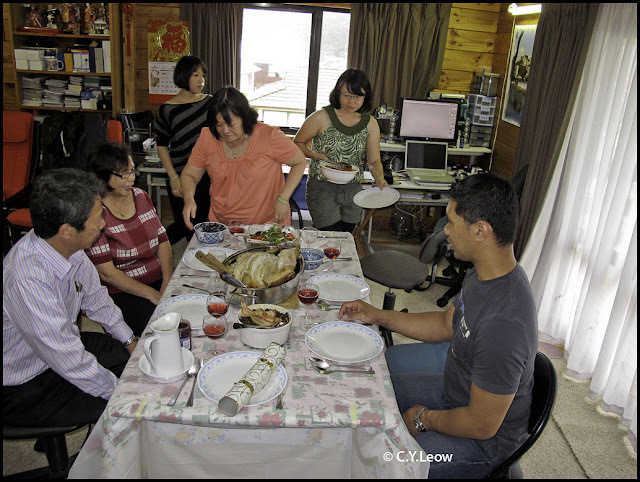 The next night we host a dinner for Ken and Yoke Yee, parent of Ming's friend Ellen, and Jeff from Auckland. As you can see from the photo, that was our second bird; roast the same way. I will tell you how we did it at the end. The side dish for the big bird, from left; roast carrots and kumara (sweet potato). 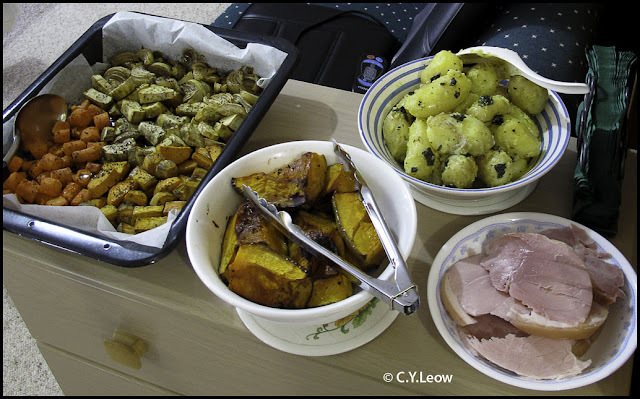 Roast pumpkin, boiled potatoes and the traditional ham on the bone. Ming also made a delightful salad with rocket, cucumber and tomatoes to go with the meat. 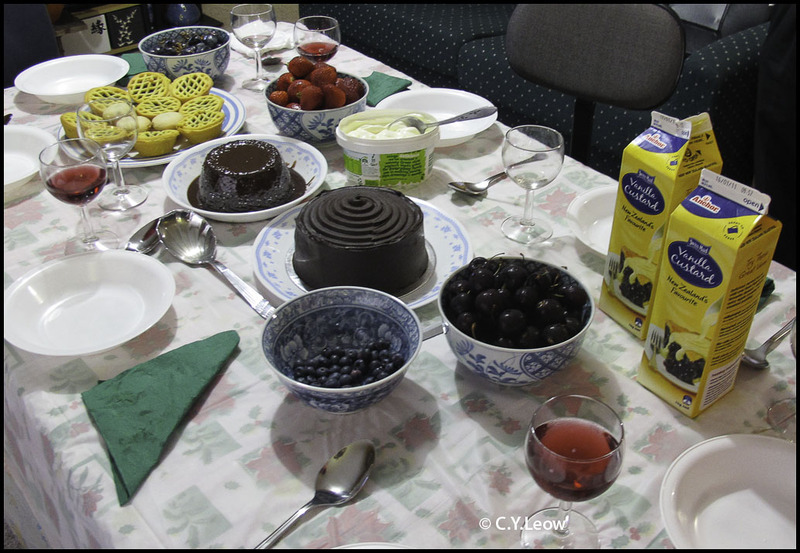 Sweets for my sweet.. traditional mince pies, blue berries; strawberries, black seedless grapes; choc pudding; choc cake; yogurt and custard and New Zealand grape juice to wash them down! 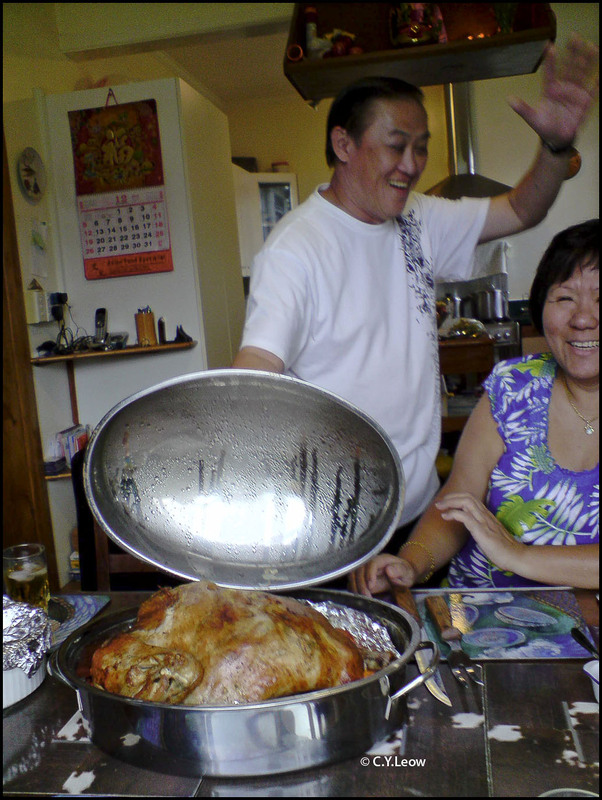 How we roast our 6kg turkey. First, go and get a roasting pan with cover! That is the trick to keep the bird moist! 1. Preheat the oven to 200C, fan forced; 'bake' setting. 2. Rinse the bird under running cold water and pat it dry; inside and outside with paper kitchen tower. 3. Run your hand under the skin and with the help from a small knife, separate the skin from the fresh but be careful not to tear the skin. 4. Rub semi melted soft butter under the skin, between the fresh. 5. Rub the same butter all over the bird. 6. You can stuff the bird with your favorite stuffing but make sure the cavity is only 1/3 filled. 7. Grind lots of sea salt (NOT table salt) and cracked pepper inside and outside the bird and rub them in a bit. 8. Pour two cups of chicken stock into the roasting pan, make sure the stock do not overflow the rack inside the pan. 9. Close the bird's cavity with skewer or toothpicks and tie both legs together with kitchen string. 10. Place the bird on the rack, back upward. 11. Put the cover over the pan and into the heated oven. 12. Bake at 200C covered, for TWO hours. 13. At end of two hours, remove from oven, uncover and brush butter all over the skin. 14. Pour two cup of stock in the tray if previous one has dried. 15. Put back into oven, UNCOVERED and leave for 90 minutes at 180C. Monitor the browning of the skin, the skin might get burned in the last 30 minutes. Turn down the heat if needed. 16. This is the time to put in your tray of vege for roasting. 17. Take out the bird after 90 minutes, pierce the thickest part of the meat and make sure the liquid coming out is clear and not reddish. 18. Put the cover over the bird and leave outside the oven to rest,for at lease thirty minutes. This is very important, the juice in the bird will redistribute and keep the meat moist. 19. Pour out the juice, using the lid to prevent the heavy bird from sliding out of the pan. Add corn flour to some cold water and mix well, pour mixture into turkey juice over small flame to make a delicious gravy. If you follow our instruction, this is what you will end up with! Taken with LG mobile phone. Ellen Ho commented on my link. Ellen wrote "Thank you Uncle CY for hosting a lovely dinner and sharing the recipe of the turkey!" Loh Ch commented on my link. 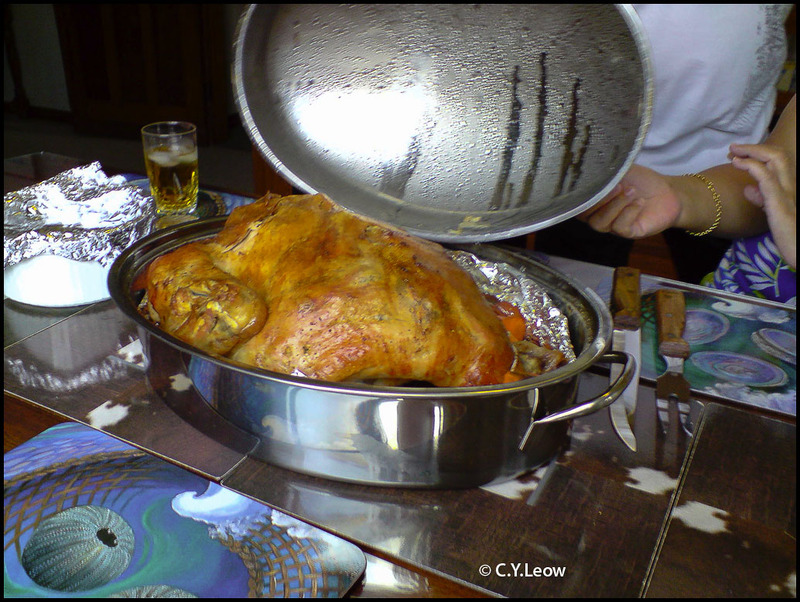 Loh wrote "When are U going to cook the "Big Ayam" for me...:)"
Thanks heaps CY, the turkey was awesome!! It's occasions like this that makes us want to come back all the time! 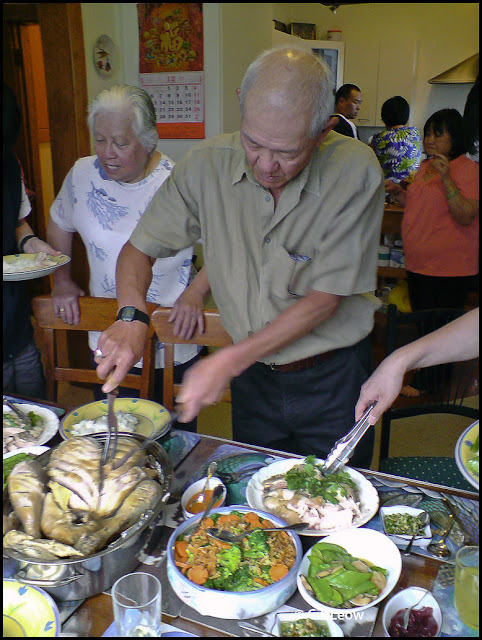 Beautiful people and always plenty of delicious food....really "Tok Kong".